Excited to be teaming up with Shopstyle + Barneys Warehouse to share some of my favorite looks for Summer. As an avid Barneys Warehouse shopper, online shopping for me is where it’s at because I always find deals on my fav designers which is key. 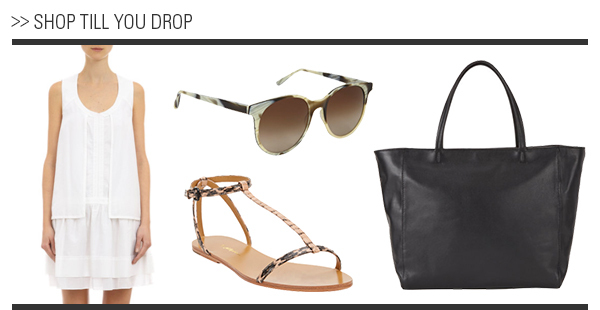 I thought it would be fun to put together 3 looks for you to get excited for Summer time dressing. As you can see below, I am loving black and white. Read all about it below. There is nothing like dressing for a girls night out. I love to take these opportunities to wear the things I am loving, and maybe my fiancé doesn’t. The girls always know and appreciate those trendy pieces. 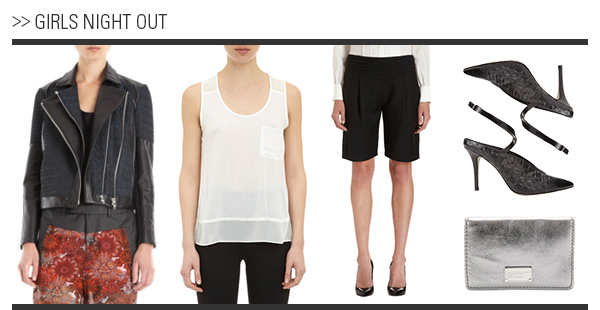 Loving these burmuda shorts paired with as simple white blouse for a classic tailored look borrowed from the boys. I love adding on a leather moto jacket to give a rocker edge to my look. When it comes to my purse, I like to travel light because who knows where the night will take me. Love this little card holder as the perfect piece to stow in my jacket pocket. I love to get dressed up for a dinner date. Any opportunity I have to pull out a little black dress makes me one happy girl. Love this layered wrap dress and it’s ability to show just the right amount of sexiness while still staying super posh. The pointy toed mules tap into my fav shoe trend of the moment. I finished off my look with a small textured clutch with a pop of metallic detail that I love to keep my look fresh. For a day out shopping, I like to be on the more casual side but still put together. I don’t like to dress in a lot of layers to make it easier when trying on some of my fashion finds at the store. Flats are also essential when I am running around. Love how these shades top off my look with some fun pattern and keep in my black and white vibes. Hope you feel ready to step up your Summer closets. I am excited to share an amazing giveaway brought to you by the lovely people at ShopStyle and Barneys Warehouse. It’s called “Set Your Sight on Summer Giveaway” and you can enter for the chance to win a $5,000 Barneys Warehouse Shopping Spree. Kind of major for updating your closet! All you need to do is submit your name and email. To enter, head here. Good luck fashion friends! Christina Storm - Great picks! Maggie - I love all of these looks! I am so glad you showed me the Barney’s Warehouse! I always forget to check it out! nikki - love the shopping look! that white dress is too cute! Melissa - Love all those picks! Fashion Musings Diary - The heels are amazing! Faux Fancy - LOVING your makeup. It’s the perfect cat eye!